IKEA worked with UK artists and designers to create this series of animal habitats, repurposed from the company's used furniture. The project was masterminded by IKEA's creative partner, the advertising agency Mother, to promote the opening of IKEA Greenwich — its "most sustainable store", according to the Swedish company. "Now all of our new neighbours can enjoy an amazing home," said IKEA. "Even our furry, feathered and flying friends." 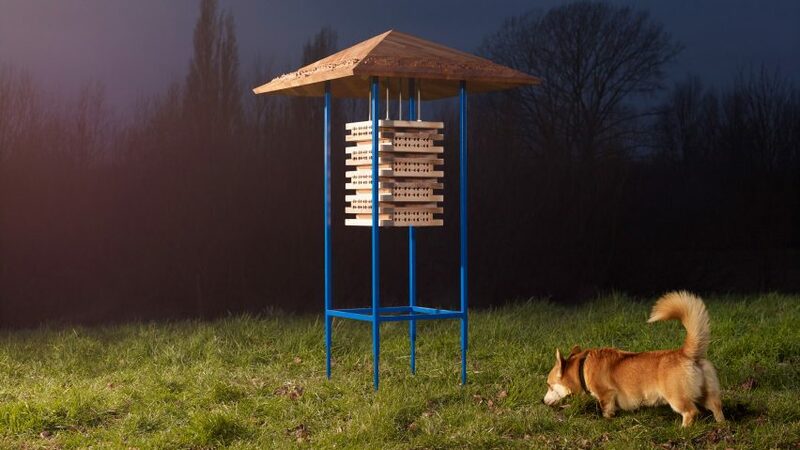 Bold Memphis-style shapes and colours recur among the designs, including Furman's Bughattan, a totem pole-like tower with holes cut into it that invite bees and wasps to stop and rest. Furman created it from IKEA Eckbacken and Hammarp worktops. Other participating architects were Sash Scott and Tamsin Hanke, who created the freestanding Hachi House, "an eye-catching bee house fit for a queen", from Industriell and Verberod benches. Månstråle House by architects Beep Studio is a more organic-looking design with old Stråla lamp stands repurposed into nesting pods for birds, while Honey I'm Home! by artist Hattie Newman is a "Brazilian-style" bee village that was once Burvik side tables. IKEA and Mother have worked together since 2010, creating the "Wonderful Everyday" campaign as well as a recent rubbish-clearing boat. However, Dezeen deputy editor Tom Ravenscroft has criticised the store's sustainable credentials, since its construction required the demolition of another green building, the Sainsbury's Greenwich, just 17 years after its opening.